Various common usage filters were tested with a spectrophotometer* to determine their transmission with regard to air. 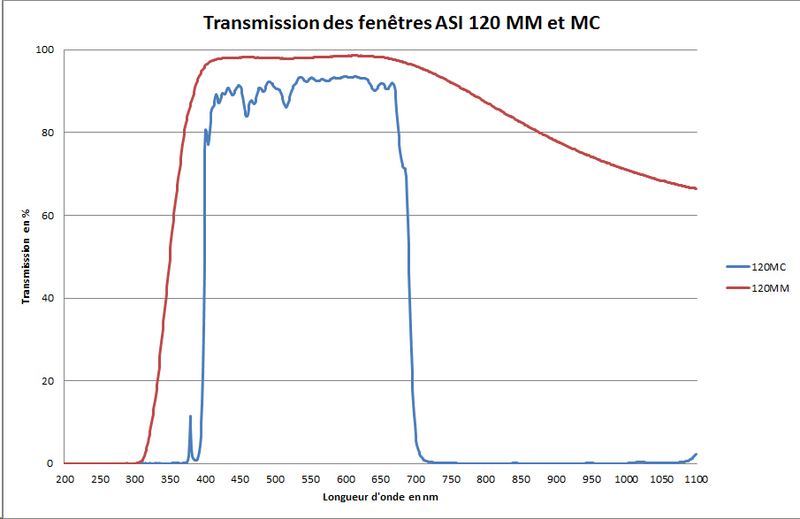 The results are presented as transmission curves according to the wavelength from 300 to 900 nm. These curves can probably vary slightly from a filter to the other one. Filter for "Luminosity" in "LRGB" acquisition . Eliminate UV and IR. Advised behind astrosolar D=5. Filter for Red layer in "LRGB" acquisition. Filter for Green layer in "LRGB" acquisition. Filter for Blue layer in "LRGB" acquisition. Violet filter. Attention, IR is transmitted what can be annoying for CCD using. Filter essentially dedicated to the observation of the planetary nebula. Windows of cam ASI 120 MM and MC.